Drawn for a compilation way back when ComicGenesis was Keenspace (and the only URL for the site was “hellsing.keenspace.com”). Erin: Hey! 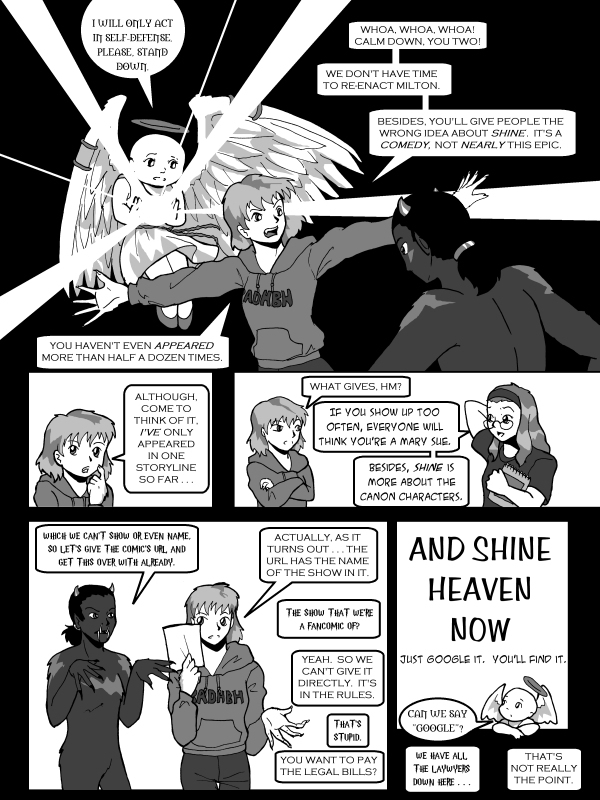 My name’s Erin, and I’d like to tell you all about my comic: And Shine Heaven Now. 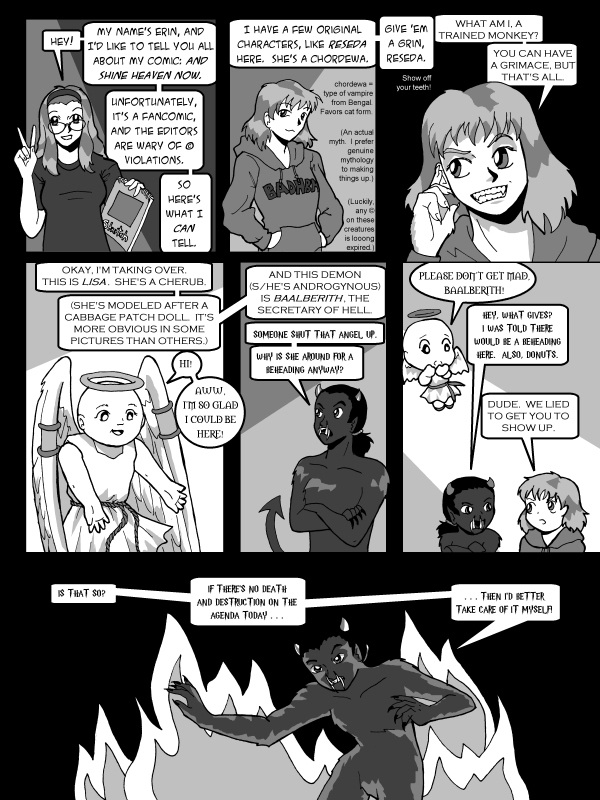 Unfortunately, it’s a fancomic, and the editors are wary of copyright violations. So here’s what I can tell. I have a few original characters, like Reseda here. She’s a chordewa. chordewa = type of vampire from Bengal. Favors cat form. Reseda: What am I, a trained monkey? You can have a grimace, but that’s all. Lisa: Hi! Aww, I’m so glad I could be here! Reseda: And this demon (s/he’s androgynous) is Baalberith, the secretary of Hell. Baalberith: Someone shut that angel up. Why is she around for a beheading, anyway? Lisa: Please don’t get mad, Baalberith! Baalberith? Hey, what gives? I was told there would be a beheading here. Also, donuts. Reseda: Dude, we lied to get you to show up. Baalberith: Is that so? If there’s no death and destruction on the agenda today…then I’d better take care of it myself! Lisa: I will only act in self-defense. Please, stand down. Reseda: Whoa, whoa, whoa! Calm down, you two! We don’t have time to re-enact Milton. Besides, you’ll give people the wrong idea about Shine. It’s a comedy, not nearly this epic. You haven’t even appeared more than half a dozen times! Erin: If you show up too often, everyone will think you’re a Mary Sue. Besides, Shine is more about the canon characters. Ballaberith: Which we can’t show, or even name. So let’s give the comic’s URL and get this over with already. Reseda: Actually, as it turns out…the URL has the name of the show in it. Baalberith: The show that we’re a fancomic of? Reseda: Yeah. So we can’t give it directly. It’s in the rules. Reseda: You want to pay the legal bills? Just google it. You’ll find it. Lisa: Can we say “google”? Reseda: That’s not really the point.